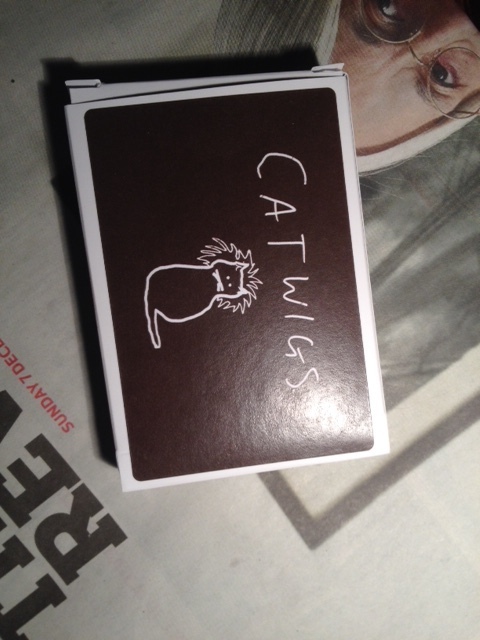 Catwigs are a set of cards that help you interrogate your project and are described in detail here. This post is about how we got them made and how we put them in a box. Not everyone’s cup of tea perhaps. 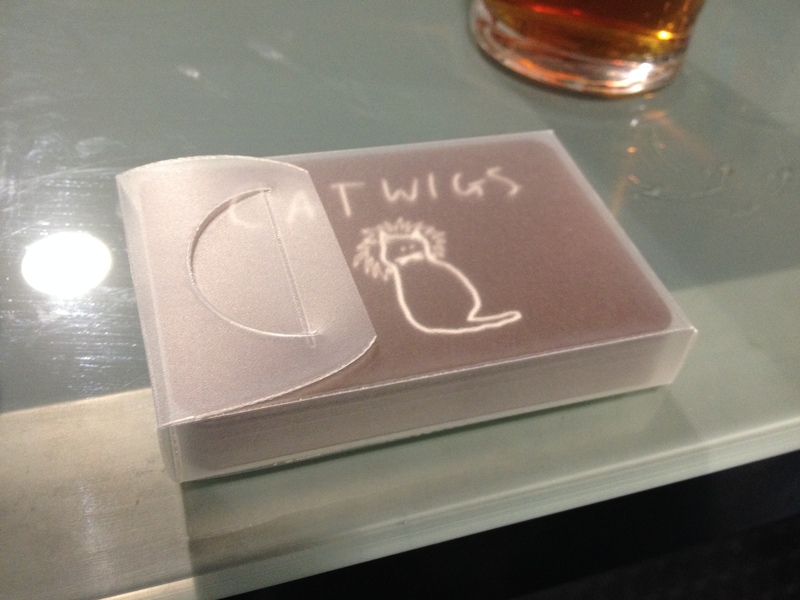 At the start, we copied Giles’ use of Moo for his alpha “strategies for people like me” cards and had our catwigs printed at Moo, who print business cards, among other things, and are very reasonable. 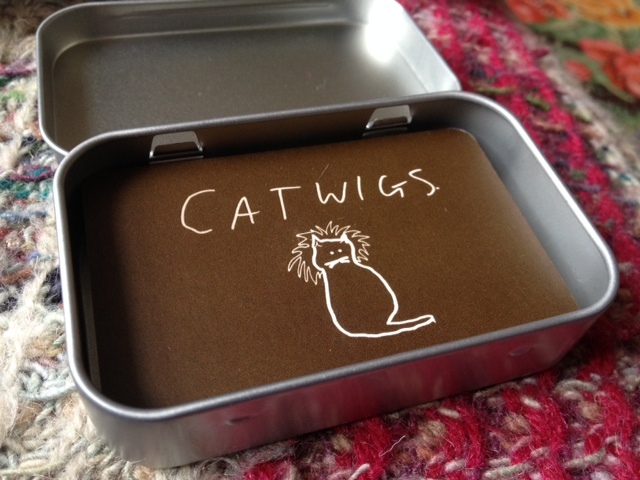 There are 25 catwigs in a set (analogies are pretty difficult to think up), so this posed us a problem: the Moo boxes (and most other business card boxes) were far too deep, as they’re all designed for 50 cards. 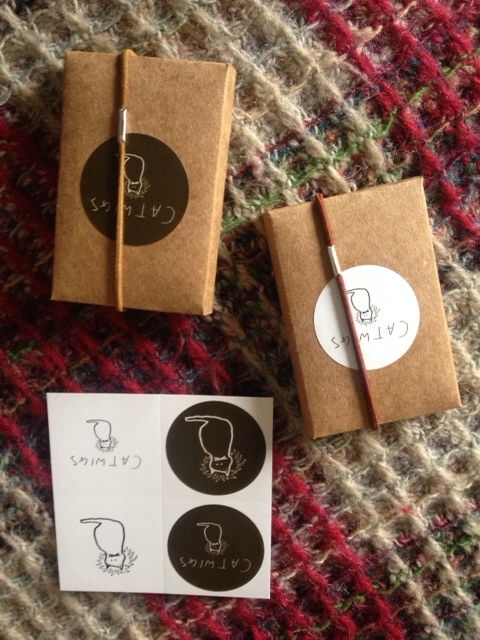 In any case, Moo only provide a few boxes for any given delivery of cards. So what could we put them in that would fit correctly, be robust enough to carry round, but readily buyable or makeable at a reasonable price? It’s proved a surprisingly difficult problem. 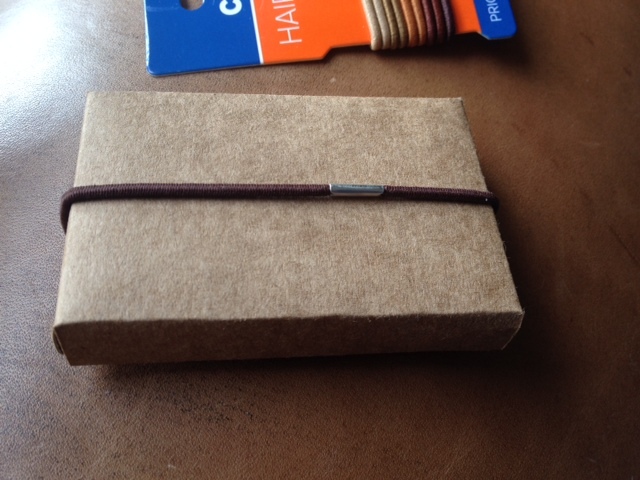 First I put them in a slip of cardboard, inspired by some simple cardboard business card holders from Muji, using a bobble to secure them. They did the job (especially decorated with a round sticker from Moo) but we wanted something a bit more robust. I had a brief detour looking into custom-printed elastic, but didn’t get anywhere, sadly. 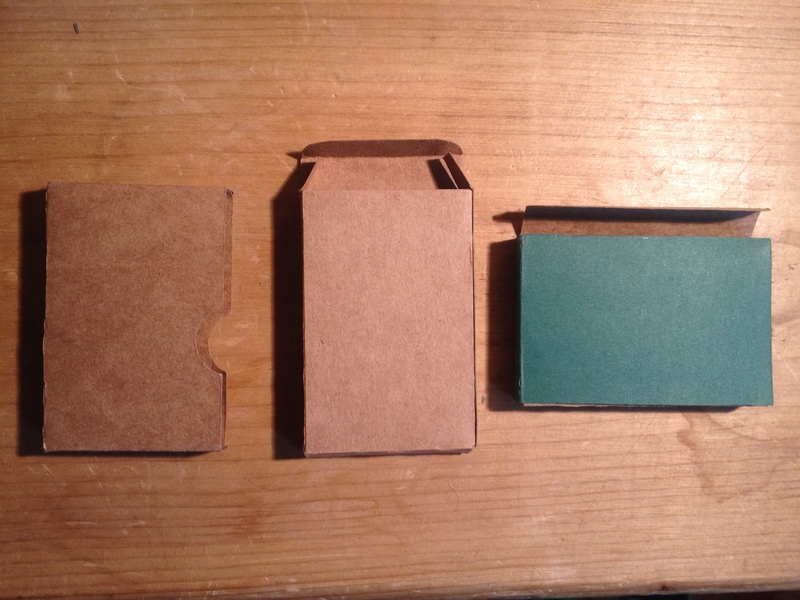 I started to investigate different types of boxes, and made a few prototypes from Richard’s big book of boxes. The problem with these were that they all involved glueing and were quite fiddly to make, so a bit impractical for more than a few. At this point we started to look into tins. Tins are cheap, readily available and robust. However, THEY ARE ALL THE WRONG SHAPE. 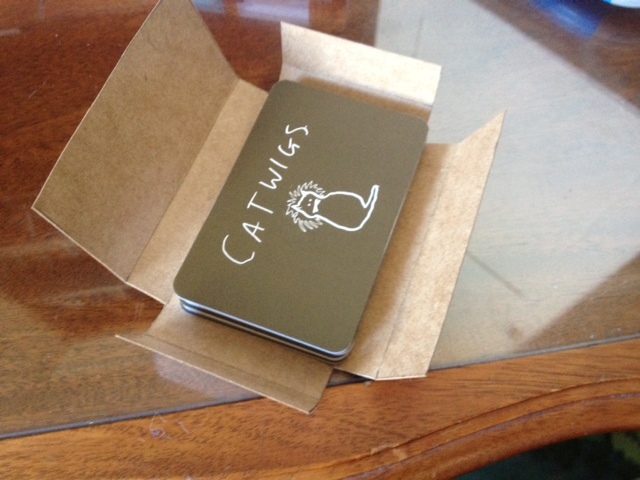 Our cards are “standard” business card size (there isn’t really a standard size but this is a common one). The closest tin size is this one (95 x 65 x 21mm) which is fractionally too small when you take into account the cuve of the corners, such that the cards get a bit stuck when you try and get them out. I had an entertaining time (not entertaining) cleaning off accidental Cyanoacrylate-fumed fingerprints caused by sticking in ribbons so that they could be more easily removed. These are near-perfect (found thanks to Dirk) but cannot be ordered from outside the Netherlands. There are plenty of tins from Alibaba, but it’s very hard to know whether they will fit, because of the curved corner issue. We could also have had bespoke tins made but not in small numbers. At this point we looked into personalised playing and game card printers. It turns out there are lots of these – and this is what Giles went with his Blockbox cards in the end (from MakePlayingcards). 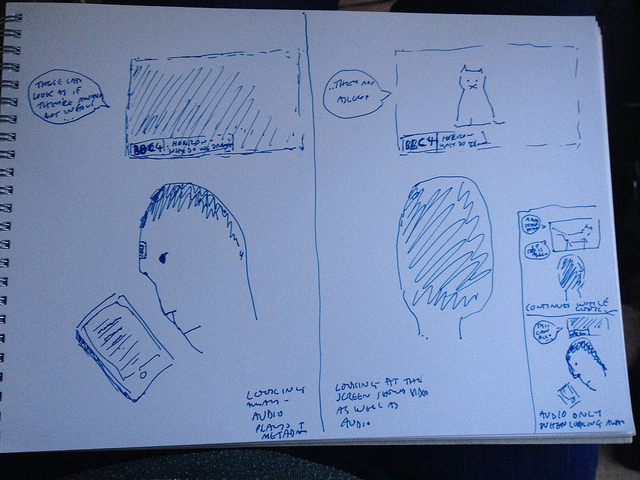 Here are some possibilities (that last one lets you publish your own games). They’re all in the US however, which adds in a layer of complexity when everything gets stuck in customs. We did order some at a very reasonable price from Spingold, but we ran into the box problem again – they’re happy to put fewer cards in the box, but custom boxes are more problematic. The cards themselves shuffle better than the Moo ones, but I prefer the matt texture of the Moo cards, and also that I can keep stock low and just order as many as I need. 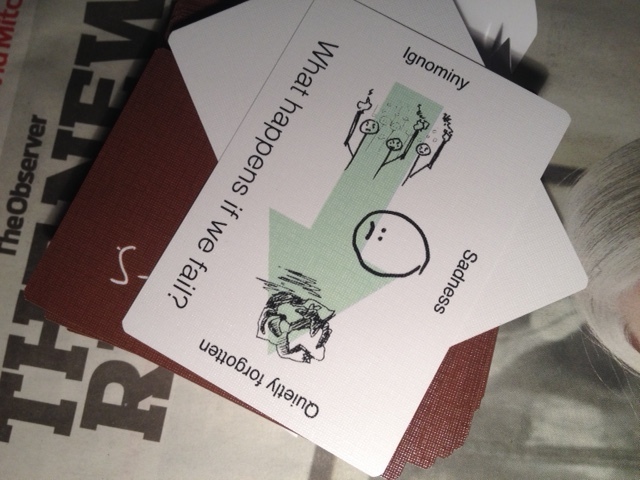 Anyway this is our current box design for these beta cards, also inspired by one in Structural Packaging Design. I’ve been cutting and scoring them on a laser cutter from 320 gsm “frost” polypropelene (from Paperchase). They are reasonably robust, easy to put together and the correct size, so I think they’ll do for now. This entry was posted in Uncategorized on February 17, 2015 by libbymiller.